It may not be the most well-known, outside of the US anyway, of Disney World’s attractions, but Adventureland’s Enchanted Tiki Room captures and encapsulates the magic of everything that Walt’s Kingdom was, and is supposed to be. Featuring a Polynesian chorus of flora and fauna performing a variety of songs and hosted by a multi-national quartet of colourful macaws; it’s one of those places where you just drift away and forget all of your cares and worries. And reading Jon Adams and Horacio Domingues’ book based on the Enchanted Tiki Room does exactly the same, as you find yourself falling into the story and being subsumed, delighted and fascinated by the plethora of characters involved in telling the tale that allows, for a couple of hours at least, your imagination to float away and leave all of the everyday nonsense behind. 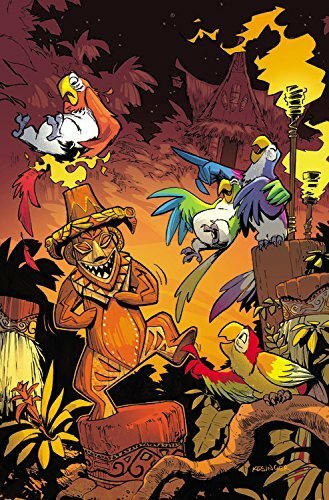 Told by one of the Tangaroa, the father of the Tiki gods, the Maori version of Zeus or Odin but much smoother and far more suave, the Enchanted Tiki Room is essentially a Disney version of that old seventies television favourite Fantasy Island. It’s a high class resort visited by troubled families and individuals whose dysfunctional and troubled relationships are gradually ironed out and sort of mended, bear in mind that these folks were properly crazy when they arrived and all of the sorcery and therapy in the world couldn’t fix them properly, thanks to the magic of the Tiki Room and the island paradise on which it’s located. But the resort isn’t without its own problems, as the famous band (the previously mentioned macaws) who lead the show that helps weave the wonders, believing that the grass is greener on the other side and that they’ll be fine without each other, go their separate ways only to discover that what they previously had was actually pretty good and the real world, when you’re on your own, can be a dauting, scary place. Then there’s the mischief that’s afoot thanks to a certain narcissistic member of staff who threatens to bring the resort crashing down around the ears of the guests, the performers and the old Gods alike. The myriad of sub-plots and drama that, combined with the main story arcs, ensure that each and every page is crammed full of funny, warm, gentle writing that’ll strike a chord with, and melt, even the coldest of hearts.